Last week, back judge Todd Prukop became a mini-celebrity by throwing his penalty flag a whopping 31-yards, impressing announcers and social media all across the country (video). Besides having a great arm, how can officials make their penalty flags fly such a long way? First of all, penalty flags are mostly made of nylon; some are cloth. When officials want to call a foul, they need to throw the flag precisely – sometimes from a long distance. If there wasn’t a weight attached to the flag, it would be like throwing a handkerchief or wash cloth out on the field. Historically, officials at all levels had to put their own weights into penalty flags. Officials used fishing sinkers, lead weights, ball bearings, washers, golf balls, BB pellets, popcorn seeds, or whatever else they could find. Some officials tied off the weight with rubber bands creating the ball look while others sewed the weights into the flag. The referee, umpire, and line of scrimmage officials usually put light weights into their flags because they didn’t have to throw the marker as far as the deep officials. Deep officials (side judge, back judge and field judge) would really weigh their flags down, usually with a golf ball, for those long tosses. 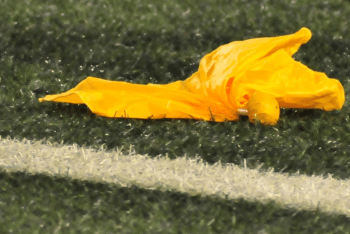 Over the years, officials and equipment manufacturers have perfected the penalty flag weight. Today, almost all penalty flags are weighed down with sand. A small plastic bag of sand is sewn or taped into the flag by the manufacturer. The weight is attached to either create a ball look or the weight is sewn in the center of the flag. Manufacturers still vary the weight of the penalty flag, depending on how far an official has to toss it. Officials toss the flag high in the air if there is a dead ball foul and throw it at the spot of the foul especially if the penalty is marched off from that spot. Officials are instructed not to throw the flag at the player, but throw it at his feet. Sadly, several years ago, referee Jeff Triplette tossed his flag in the air for a false start and in a freak accident, the flag struck Orlando Brown in the eye, damaging his sight. Brown shoved Triplette to the ground in a fit of rage. The NFL did not fault Triplette for the incident and he and Brown reconciled years later when the player made a comeback. Officials carry their flags in their back pocket, side pocket or stuffed in their pants with just the ball weight sticking out at their belt. No matter how the official wears his flag, he or she is encouraged tuck it in deep and not have the flag hanging out of the pocket. The conventional wisdom behind this is a “floppy flag” looks sloppy and it looks like the official can’t wait to throw it. Officials are also advised to carry two flags on the field in case they have to call two fouls during the same play. It takes a bit of practice, but officials at all levels become very adept at throwing the flag to the exact spot on the field. So, the next time you notice an official launch his flag and it lands at the right spot, know 60-years of penalty flag engineering and hundreds of practice throws have gone into making that call.